I moved to this parish in June 2017 and I'm excited about the future here. I am married to Nigel and we have two teenage children, a dog, two cats and two rabbits. It's a busy and fun household! After teaching maths in secondary schools around Birmingham, I took a break to be at home with our children. During that time I enjoyed volunteering with the team at Holy Trinity Church, Sutton Coldfield where I discovered my calling to be a priest. I trained at The Queens Foundation in Edgbaston and was ordained in 2014. I served my curacy in Coleshill so I knew this parish a little and was excited about the opportunity to work here. My passions lie in pastoral care, worship and discovering the gifts of others. I'm also really looking forward to working more closely with Shustoke School. We are blessed in the parish with a number of wonderful lay ministers and together we share different passions and gifts to hopefully offer something for everyone. Parish Reader and Church Warden at St Cuthbert’s, Shustoke. I grew up in Whitacre, with my twin sister and attended Shustoke School, which was by the church, now Alms Houses no’s 1&2. We went to Coleshill Grammar School; I then studied in Dundee and York before embarking on a lifelong career in teaching science, later specialising in Pastoral Care. I have lived in York, Solihull and Shustoke, taking over the family home in Hollylands, in 1979. I have always attended church - Shustoke, Coleshill, Scottish Presbyterian, York Minster, Knowle, and then back to Shustoke in 1979. Having become very involved in the local church, I was encouraged to become a Lay Reader by Revd Clarke and was licensed in 1989. His policy was “Gill, you can do anything in an emergency, if I can’t do it, it’s an emergency!” I took my first service at Lea Marston in 1988! (In those days there were 4 morning services and 2 Evensongs). I have 2 sons, a stepdaughter, 6 amazing grandchildren and a hyperactive spaniel, Mollie. I thrive on being needed/useful; otherwise I walk, garden, read, cook and bargain hunt. I was born in a small village in Wales, too many years ago for me to remember! I eventually became a nurse for people with learning difficulties. The job took me to work in North Wales, to Surrey and then to Coleshill Hall Hospital and Chelmsley Hospital where I became a nurse teacher and finally a tutor for managers and NVQs. I was taken to chapel every Sunday as a child, but then stopped going to church until early 2000. I decided I wanted to look deeper into faith and the church and did a couple of courses, eventually becoming a Lay Reader. I really enjoy taking services, assisting at services, preaching and leading intercessions. I also married Janice some 30-odd years ago and am expecting time off for good behaviour any time soon!! I've been coming to St John's Church, Lea Marston frequently since 1992, while also exploring the life and ways of a number of churches of different contexts styles and denominations, hoping for understanding in what makes church real and successful for our times. I was licensed in 2014 to the Parish as a Reader (Lay Minister), shortly after our long standing family business designing and producing stage sets for the entertainment industry was taken over by others. Now I am embarking upon a new legal career. I enjoy every opportunity to preach and take and assist in church services, and look forward to everything that may be happening in our parish, churches and communities as they grow in Christian fellowship, ministry and discipleship in the 21st Century. I was born and lived in Coleshill until I moved to Whitacre Heath in 1975, I still have that house in Coton Road. 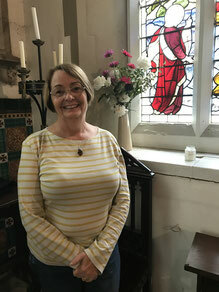 I began attending church at St. Giles when my oldest child Louise began school in 1979 and have been a regular attendee ever since. I was baptised and confirmed at St. Giles by Bishop Hugh Montefiore, much to the disappointment of the then Rector Edwin Clarke, who had wanted to carry out the baptism himself! In the past I have been a choir member and was also a bell ringer for nearly thirty years. My two children Louise and Kevin were both baptised at St. Giles, they both attended the church school until its closure and Kevin married his childhood friend Tracey at St. Giles two years ago. 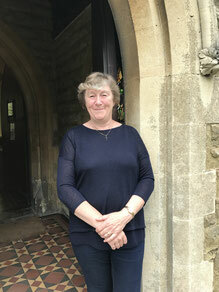 My second husband Eric and I were married at St. Giles in 2001, after Eric also became a regular worshipper; we now live in Old Arley, but continue to support the work and worship of the Parish of The Whitacres, Lea Marston & Shustoke, where I have been church warden of St. Giles & St. John’s for nine years and more recently one of the Parish Churchwardens. We have run our own engineering business, which Eric began over thirty years ago, until we recently retired, and hope now to have more time to do the things we have always wanted do but never had the time! Churchwarden St Cuthbert's and a parish church warden. Crucifer and server at Shustoke church and within the parish. 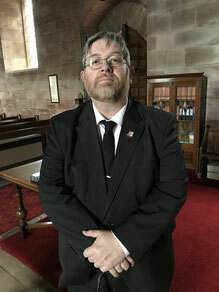 Chairman of Nether Whitacre Parish Council. Chairman of Coleshill and District Branch Royal National Lifeboat Institution. Section Warden on the Heart of England way long distant footpath. Warwickshire County Council parish path volunteer and group leader. Carpenter and joiner within the family company. In my spare time I enjoy being with my family and our kittens, and being with friends, cooking, gardening, wildlife, birds and the countryside, particularly Scotland. My mum always said that I carried Bible round as a small child, I cannot remember a time when my faith wasn’t important to me. I was born in Abingdon, the fourth of six children. I moved north in 1974 and then to University at Lancaster where I met Tony, my husband of 35 years. We have two grown up children, a lovely daughter in law and two step-granddaughters. I trained as a multi-faith RE teacher and recently retired after 35 years in schools. This gives me more time to devote to my role as church warden at St John the Baptist Lea Marston and governor at Shustoke primary school. I still do a little part time work but do have time for hobbies of baking (essential in church work! ), my cats, drawing, reading and crochet. I was born in Over Whitacre and Baptized at St Leonard's. I attended the church school and Sunday school. My family were farmers here and attended church at both St Giles' and St Leonard's. I worked on the farm until I was 21 and then decided to have a change of career to work with airlines. I worked for Britannia Airways in Gatwick and then for Gulf Air in Bahrain where I lived for 4 years. I returned home to have my children. My son also seems to have my travel bug and lives in Calgary Alberta, a beautiful part of the world. He just married a Canadian, Rebecca, a few weeks ago. I became church warden in 2010. Before that I was PCC secretary for St Leonard's until we became one parish. My hobbies are gardening and I am also a governor at Woodlands special School in Coleshill. I drive the mini buses and love helping with the children in school. My retirement has given me the opportunity to become more involved in church life which I find very rewarding. Having taught in a variety of Junior SchooIs, I have recently returned to my native parish of Over Whitacre where my family have lived and worshiped for several generations. I am married to a farmer and have interests in music and local history. I was very involved in our local Methodist Church in Sheffield where I grew up, following my mum and grandma. I was a Sunday School teacher, Brownie, Guide, member of the church choir and was very lucky to be chosen as Sunday School Queen. I left Sheffield to go come to Birmingham to the Polytechnic and like many people, stopped going to church on a regular basis. I stayed in the area, married Alan and spent the majority of my working life in the NHS plus 4 years working at a local brewery! It was a friend’s wedding that brought me back to church – for which I am eternally grateful. 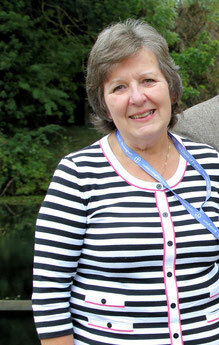 I help where I can, and have been the Parochial Church Council secretary for 15 years. Now retired, I find I have time on my hands; I really must find something to do! 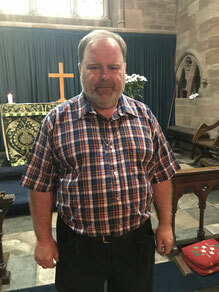 Andrew has worshiped at St Cuthbert’s since the late 1970s and has fulfilled the role of Director of Music there since 1992. He was educated at The Coleshill School and studied at the University of Birmingham. He retired as Head of Sixth Form at Lichfield Cathedral School in 2016. He is now an Honorary Visiting Research Fellow at the Centre for English Local History at the University of Leicester where he studies the everyday lives of people living in the forest of Arden in the fifteenth and sixteenth centuries. He feels privileged to contribute to the worship in the same historic buildings where many of the people he has become acquainted with through his researches attended in earlier times. As Director of Music he strives to provide enhancement to the experience of the liturgy through a steadily expanding repertoire of hymns, songs and music from different traditions. He particularly enjoys staging the Service of Nine Lessons and Carols at St Cuthbert’s.